In the early years of our marriage, Bob and I went with my father-in-law, my brother-in-law, and assorted friends to the Shirley Mountains to get wood to burn for heating their house. 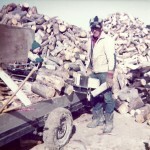 We would spend the day hauling log after log to the trailer we had brought. By lunchtime, I was starving!! Carrying those big logs was hard work, but it was beautiful up there in the mountains. My father-in-law wanted to burn wood as much as possible to save money on heating bills. Many people were turning to wood burning stoves to cut costs, and the BLM was letting people buy permits to clear the dead fall for the mountains to cut down on the fire hazard up there. We went up several weekends, and brought back lots of wood. Then began the work of cutting and splitting the wood. We had quite a production going. The guys had a rhythm going. 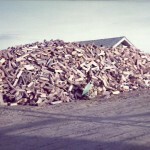 They cut the logs into pieces the right length, then they went to the splitter, and were tossed onto the woodpile. Even the little kids pitched in.They thought they were so grown up, when we allowed them to help stack the wood. 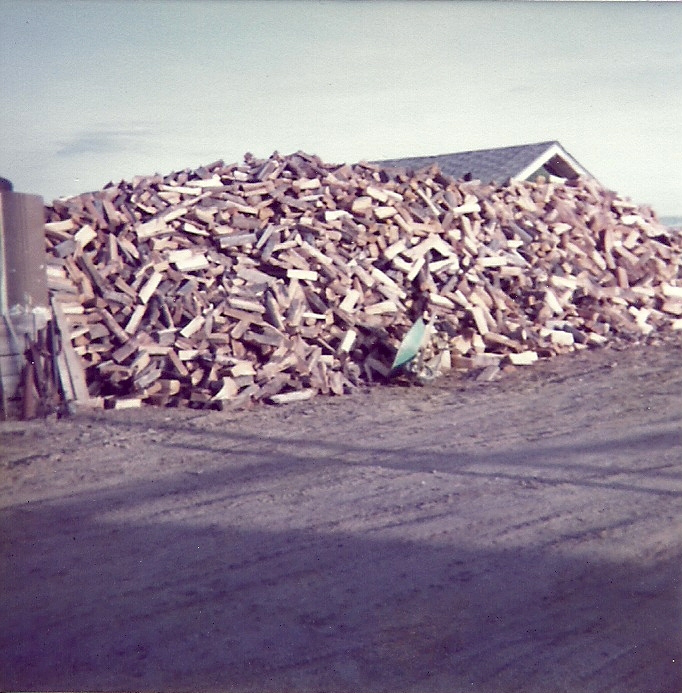 Over the next few years, the woodpile would get to be so huge that it looked higher than the house. We were all shocked at what we had. You could see it from a long way off. 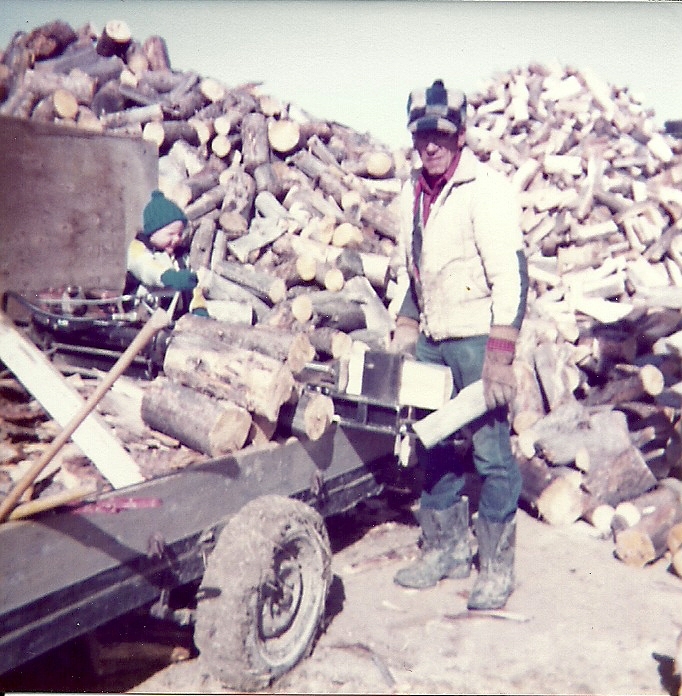 One thing was for sure…my father-in-law had enough wood to heat his house for some time to come. People don’t go out and haul their own wood much anymore, or maybe I’m just out of the loop, but it was a time I will always remember…because it was such a pleasant time. When my girls were very small, we took a family vacation to visit their great great grandmother in Washington state. The trip had been planned while their great great grandfather was still alive, but the visit with him wasn’t to be. He would pass away the month before we came to visit. I was always sorry that we didn’t get to visit him too. They had been down to visit us in July and we went up in September. It happened so fast. One day Grandpa was fine, the next he fell off a ladder and broke his hip. He went into shock and was gone. We went anyway to visit grandma and I was always glad we did. She was an amazing woman. 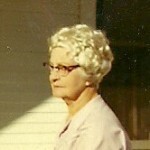 She was 89 years old that year and still lived at her own home…alone. She still cooked and kept house and enjoyed life. She would live to be 97 years old. She was so interesting. 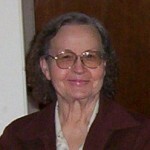 She told stories of her family and showed us a family tree that she had that was hand written and extensive. Corrie was just learning to walk then and found a little chair at Great Great Grandma’s that she loved, because it was short enough for her little legs to crawl up on and sit all by herself. Grandma would also let her play with the pans in the kitchen. She pulled them out and had them all over the floor. I tried to stop her from making such a mess, but Grandma said to let her play. She was so patient. We would go out and sit on her porch and look at the birds and the trees. Her home and yard were beautiful. Corrie, Amy, and I loved it. And she wanted to share it all with us…to pass on a piece of herself and Grandpa to our girls, Bob, and me. The beauty of a different time and place. Her home held the memories of the past and the promise of the future all in one place. I just wish I could have known her better. 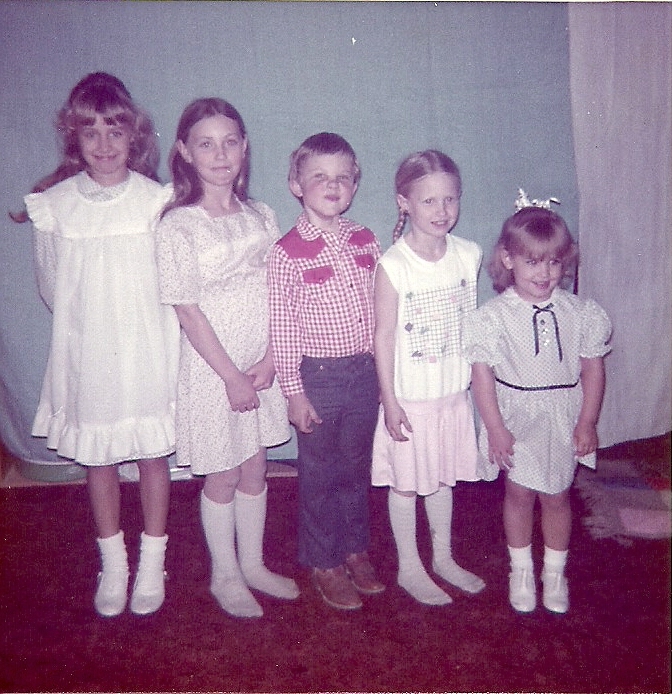 My girls, like most kids had great cousins, but like most kids, there were good days and bad days. This applied to both sides of our family. Their relationships with their cousins have spanned 3 decades and have grown into beautiful friendships, despite the rocky starts. 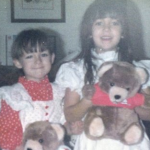 Since I was the second child, my older sister’s children were the only cousins on that side for a long time. 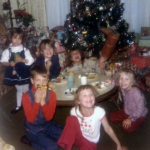 Her older daughters were always a source of goofy antics, while providing my girls with a little bit of a look at how the bigger kids acted, and what they did. 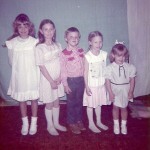 Her son gave them a glimpse into what boys were like…quite a culture shock for my girls who were around mostly girls. Her younger girls were really the ones my girls played with, and also, where most of the fights occurred. There were fights of the real and imagined kind. Now many people might not know what an imagined fight is, but I know. It is when one child tells on another child for hitting them, when in reality no such event took place. I expect this type of fight happens more than we know. Thankfully, as time goes by, those same kids who fought like cats and dogs, and then turned right around and played until they dropped from exhaustion, grow up to become wonderful adults, who are the best of friends and the greatest allies for life. On Bob’s side of the family, things were much the same. Great little friends, but also serious little fighters when they felt like their territory was being invaded. The would play together, quite happily, until someone had a toy or other item…such as the seat of an old tractor that Grandpa had, and the other one wanted. Such invasions of perceived territory, might get one socked in the nose…or even bitten. Because the kids were all so close in age, they each felt like they were the one in charge, and sometimes the only solution was to make them all come in and let them know that…none of them was in charge. We were!! Again, thankfully those years have passed and yet, the relationships survived. There truly is nothing like family. It doesn’t matter what you agree or disagree on, you always love each other. You are friends forever, because you have grown up with all the secrets, adventures, and yes, fights that build the lives of children. You have survived the most embarrassing moments, the most horrible looks, and those awful fads that your parents still cringe about. You are now adults with kids of your own. You have come full circle…and your kids are fighting with their cousins, wearing clothes and hair styles you hate, telling you that you don’t understand anything…basically after all those years of trying to be yourselves, you have become…your parents. When I was a girl, the only kids who ate their lunch were the ones who rode the bus from the country, and the ones whose mothers worked. 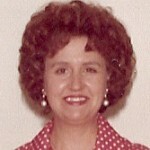 A working mother was more of a rarity in my grade school years. Moms back then made their children’s clothing, canned vegetables and fruits, made jams and jellies, went to PTA meetings, worked as room mothers, and helped with homework. I remember the bell ringing at lunch, and running out the doors of the school and off to the house. Mom would have soup and sandwiches waiting for us. My favorites were Chicken Noodle soup and Grilled Cheese Sandwiches, and Cream of Mushroom soup with toast. Yummy!! At that time, I was sometimes jealous of the kids that got to eat their lunch at school, but when I went to junior high and had to eat my lunch at school every day, I sometimes missed those days when I could run home and Mom would have our lunch waiting for us. Funny how you don’t really know what you have until it’s gone. Bob’s family lived right across the street from the school during his early grade school years, so his experiences were similar to mine, and for him it was kind of cool on track day, because his mom could watch the meet right from her yard. My cousin, Greg, who was a friend of Bob’s back then, remembers her cheering them on from the yard. It was a memory of her that he mentioned to me just recently. Bob’s family would later move to the country and he would become one of the kids who got to eat lunch at school. I’m not sure which one of us got the better deal…I have to lean toward me. Yes, things were different when I was a kid. Moms had the ability to be much more involved in their kids young years. It kind of makes me sad for the kids today whose mom’s have to work, but I guess that if it’s something you never had, it’s easier not to miss it. I don’t say that those were better times, but while we maybe had less “things” in our lives, we were so blessed in so many other ways. 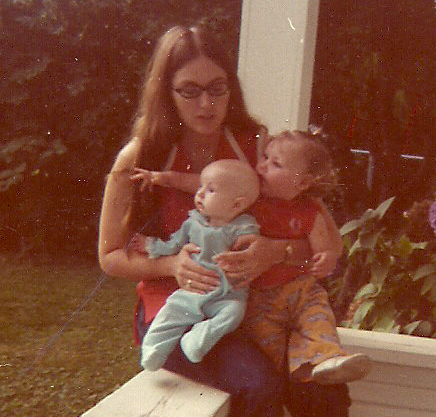 Our definition of motherhood has changed through the years, but moms really haven’t. Even if they have to work, moms do their best to be a positive influence in their children’s lives. The love and nurture. They discipline and scold. They teach and they even learn from their kids. They wipe our tears and kiss our wounds. They wear so many hats. Sometimes I think that they have more skills that any other occupation, and yet they often receive the least amount of thanks. So today I want to take a moment to thank my mom and my mother-in-law for raise Bob and me up to be the people we turned out to be. We couldn’t have done it without you. We love you Mom!! As a grandmother, I have been so very blessed. 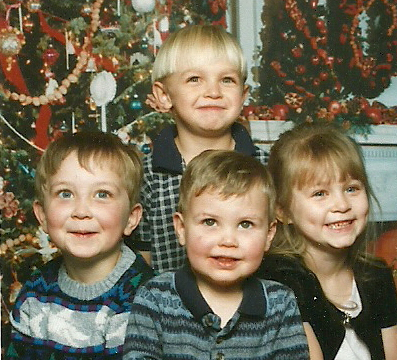 I have had the great pleasure and privilege of spending a lot of time with my grandchildren throughout their lives. Since my girls worked in one capacity or another, I transported the kids to sitters, school, etc. When the kids were little, and with so many grandparents and great grandparents in their lives, they found it hard to figure out which name goes with which grandparent. And when the last names are long, it’s even harder. So they tried to figure out ways to distinguish one grandparent from another. It’s funny, the things kids notice. 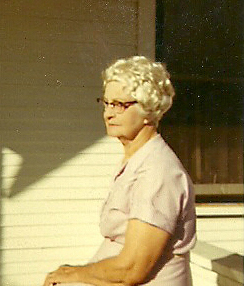 Before long, I became known to my grandchildren as “Grandma Fingernail”, because my nails were always long and painted. Well, you can imagine my surprise when I heard that. It was so comical to me, and of course, it became quite the joke with my daughters and their husbands. 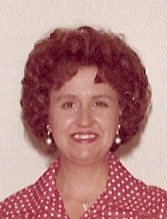 The other grandparents might be Grandma in Denver, Papa in Denver, Grandma-Papa, Grandma Foxy, Papa Scruffy (Foxy and Scruffy are the dogs), or some such thing, but I was “Grandma Fingernail”. And it turns out, I kind of liked it. My nails were a source of interest to my grandchildren…my granddaughter especially, but even the boys. They had to feel them, because of course they are long, unlike their own. They looked at them to see what color or design I might have on them this time, because I like to put flower stickers, or other design stickers on them. But it would be my granddaughter who would come up with the most interesting thing to say about my nails. She would check them carefully every time I saw her, and if they were in need of being painted, she would inform me. She would say, “Grandma, your fingernails are a meth…you better fixth them.” Of course, the translation is, “Grandma your fingernails are a mess…you better fix them.” That never failed to get a laugh, and then I would usually paint my nails…and hers. 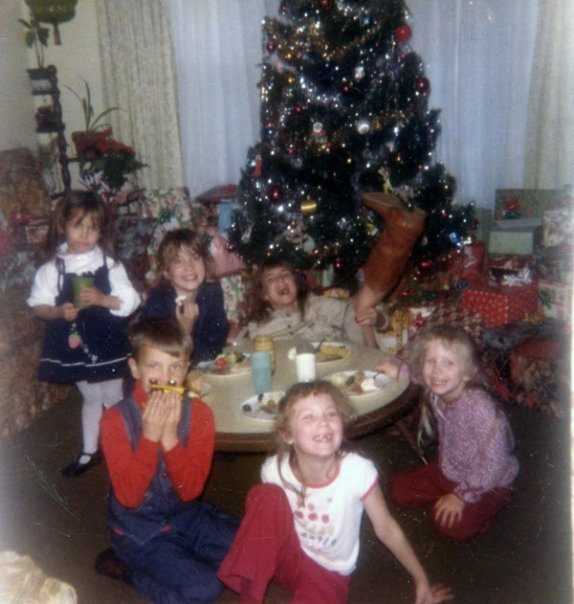 Since Bob and I bowled from the time Amy was two years old, it just naturally followed the our girls would bowl on a league as kids. They started bowling when they were 5 years old. At that time, the league they were on needed a coach, so since I was there all the time anyway, I was elected. I took a class for 3 hours on a Saturday morning, and the deal was sealed. We had some interesting moments during those early years. 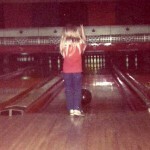 Corrie, had been bowling about a year when Amy started, and of course, she was an expert. 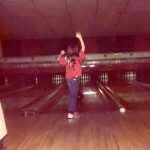 One day she was bowling and doing ok, when she went up for her turn and threw her ball. It went into the gutter before it even got to the dots, much less the arrows on the lane. But, that didn’t make any difference to Corrie. She turned around and put her hands on her hips, looked me square in the eye, and said, “That should have been a strike! !” Do you think she was around bowlers much? Corrie would learn what really should have been a strike as time went on, but we laughed about that first use of bowling terminology for quite some time. Amy had a little bit different experience however. She was pretty little at 5 years old, and isn’t very big now, but that’s another story. Her bowling ball weighed 6 pounds. 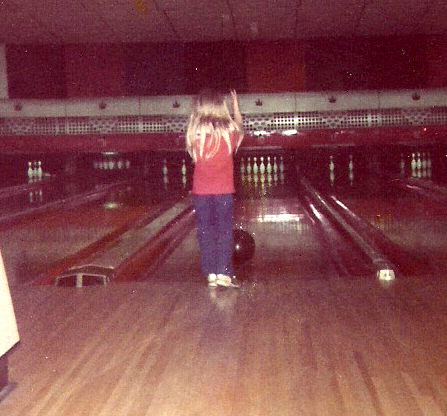 The combination of the light ball and the little girl made it difficult for her ball to do what a bowling ball should do. It would fall in the gutter half way down the lane, and stop. Someone would have to go get it and bring it back for another try. It was frustrating to her. One day, another coach who was helping, decided on the solution. 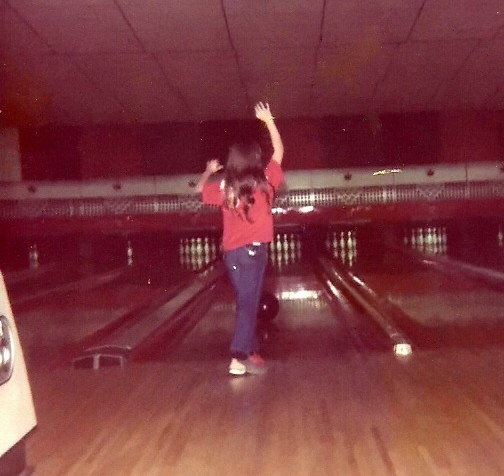 He picked Amy up…ball and all, walked down the lane until she was about a foot in front of the pins, set her down and said, “Now hit ’em!” And she did. Amy would continue to struggle with the ball speed for some time, even having the pins stop the ball, but today she has made up for it. She throws one of the fastest bowling balls around. 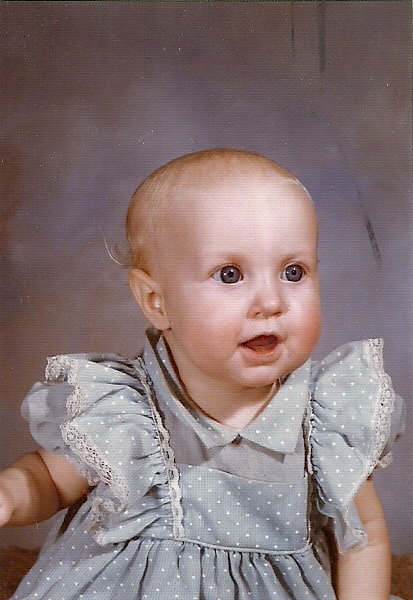 Though she has definitely outgrown that stage, my younger daughter, Amy, was every bit a blond when she was little. She was forgetful and lost things we never found…in her room!! 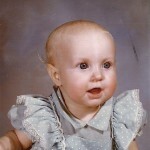 But while she was pretty ditsy back then, she has turned into very capable, responsible young woman. That is not what my story is about, however. There are two stories about Amy that come to mind today. When Amy learned to walk, she, like all kids, took those first tottering little steps…then within days, she decided that walking was just not for her!!! She ran from that time forward, which I might add, her son, Caalab, would follow in later on. She was always in a hurry. And it didn’t take her long to find another interesting way to speed things up in the area of transportation. Yes, I know what you are thinking, behind the wheel of a car…right? Well, you’re wrong. Amy decided that it took too long to walk down the hallway. Or maybe it just wasn’t enough fun. Just as soon as she figured out how, her chosen method of getting down the hallway was to somersault!! From the moment she started that, until she was in about third grade, I don’t think she ever walked down the hall. It was entertaining, to say the least. 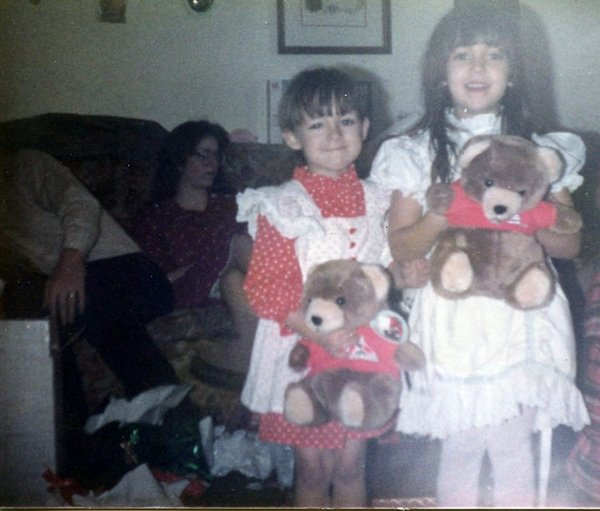 But, on an even funnier note…one day when Amy was 2 years old and learning to dress herself, she gathered up the clothes she wanted to wear and brought them into the kitchen to get dressed. She was doing pretty good with it. Everything was going on the right way, right side out, front in the right place, and so forth. I was proud of her for doing such a good job. Never a dull moment in our house…lol!! Few things are more exciting in the life of a young child than the day they lose their first tooth. Everyone knows what comes next. The tooth is placed in a glass of water, or under a pillow, and the child tries really hard to go to sleep, because they know that in the morning, there will be money, and sometimes gum, in place of the tooth that was lost. 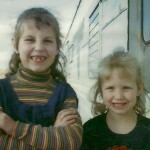 I will never forget the day my oldest daughter, Corrie lost her first tooth. The tooth had been loose for a while, and she wiggled it constantly. She wanted it to come out so badly. For days that was all she thought about, and all we heard about. Then one night…in the middle of the night, I awoke to Corrie screaming. Now when you come out of a deep sleep to a child screaming…and I mean a blood curdling scream…it can be hard to get your bearings. I tried sleepily to figure out what was wrong, thinking she had a bad dream. She screamed, “I’m bleeding” and showed me her mouth. Ok, I was awake, and my mind had it all back together again. we rinsed out her mouth and I looked to see if the tooth was loose enough to pull it out. I tried to get a hold of it, and couldn’t. I said that it just wasn’t quite ready yet. Corrie said, “Just push it Mom!” And with that, she pushed the tooth toward her tongue, and out it came. I couldn’t believe that my 5 year old knew more about how to get her first tooth out, than I did. Corrie’s teeth never presented any problems. She would go on the “push” them out easily as each became loose enough. Her sister, Amy’s teeth…well, that is another story. 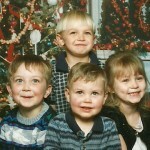 When I first met Travis, the man who would become my younger son-in-law, he was still a boy in high school. He would tell me later that he was the class clown, which I would say I have to believe. Travis doesn’t even have to think about saying funny things. They just flow out if him. I don’t mean to say that Travis has nothing serious to say, because he does. He is a hard working man, who is dedicated to his family. He has been a good husband to my daughter, Amy, and father to their children, and in the 16 years that they have been married, he has brought much joy to our lives. But, one of his favorite things to do is to laugh and make others laugh, and that isn’t a bad thing. I marvel at his quick wit. I have often noticed, when I would stop by their house, that he seems to have the kids giggling a lot about some little thing he said or did. He can take just about any situation and make it funny. There is a lot to be said for having a home filled with laughter. It is something we should all strive to have. That is a trait he has also passed down to my grandson, Caalab. They are always goofing off and teasing anyone who happens to cross their path…usually Caalab’s sister, Shai. Yikes!! Travis is also a talented musician, and plays in a band. Now mind you, I’m a country music fan myself, so the music he plays is not exactly my style, but I am proud of what he has accomplished. He is truly a man of many talents. He’s program director, DJ, advertising voice for commercials…basically jack of all trades for the local radio station, a job which is perfect for his personality. Today is Travis’ birthday, and I’m quite sure it will be a day filled with joking. Maybe…just maybe today, someone will pull a good one on him. Happy birthday Travis!! Tonight we received the news that Usama Bin Laden is dead. As I look back over the last decade, I am amazed at how much has changed. We are a different country than we were before this evil man came on the scene. Bin Laden was a man filled with hate. It was a hatred that was aimed at people of many nations and faiths. Basically this man was insane with his hatred. 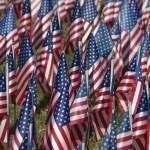 With the attacks of September 11, 2001, came a global distrust of others. We were leery of people who looked similar to the 9-11 attackers. We were nervous about anything odd concerning our aircraft. We became untrusting of people of different beliefs and cultures. It had to be, because we had to protect ourselves. It is a sad thing that people can become so consumed with hate…so possessed!! Usama Bin Laden had become a cancer in the world. And like all cancers the only solution to the problem is to kill it. He would never have stopped. His hatred was so huge that he spent his fortune to recruit people to carry out his evil plans. The world can breathe a collective sigh of relief at his death. What is unfortunate is that there are others who will continue his hatred and terrorism. Our world has many cells of people who, like Bin Laden, hate Americans and all our allies. 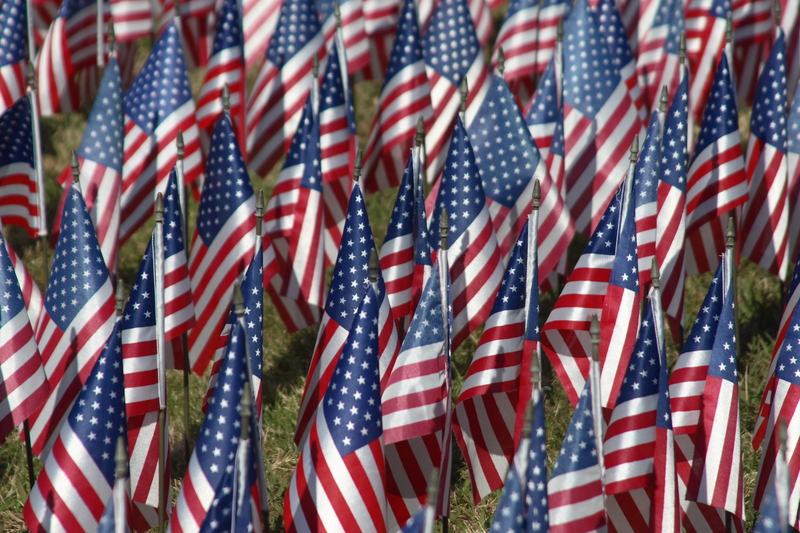 We have to continue to be strong in our resolve to rid our world of terrorists. We may never get rid of them, but with each one that is removed, we move the tiniest bit closer to a safer world.